CLEMSON 64, South Carolina 55 - Clemson improved to 4-1 all-time in Colonial Life Arena as the Tigers locked in defensively in a 64 win over South Carolina on Sunday. Clemson moved to 5-2 with the win, while South Carolina fell to 5-3 with the loss. The win was Clemson's first since 2009-10 over South Carolina, and Head Coach Brad Brownell's first against the Gamecocks as well. Three players reached double figures for Brownell's team, led by K.J. McDaniels with 16. He made all seven of his free throw attempts in the second half and added seven rebounds and five blocked shots. Devin Booker added 13 points and eight rebounds, capping a good week for the 6-foot-8 senior. He added three steals and a pair of blocks. Rod Hall scored 15 for the Tigers and made 9-of-12 at the free throw line to salt the game away late. 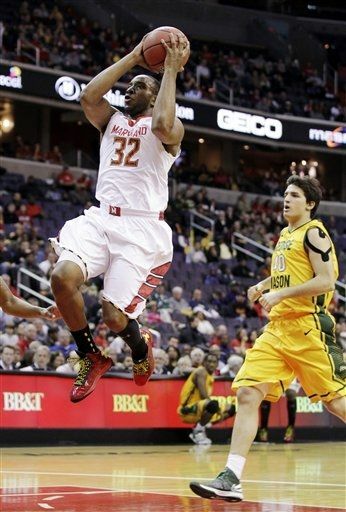 MARYLAND 69, George Mason 62 - Dez Wells scored a career-high 25 points Sunday and Maryland pulled away in the final minutes for a win over suburban rival George Mason in the BB&T Classic Sunday afternoon. The Terrapins (6-1) won their sixth straight on the strength of the inside, penetration and fast-break games of Wells, Nick Faust (14 points) and Alex Len(12). Maryland also made 23 of 39 free throws to improve to 8-0 all-time against its neighbor from the Virginia side of Washington, D.C.
Wells went 11 for 17 from the field, accounting for half of the Terrapins' field goals. Wright and Holloway combined to go 12 for 24 for the Patriots; the rest of the team was 10 for 47. Recap. Mercer 61, FLORIDA STATE 56 - On a day that saw 49 combined free throws, none were more important than the final six in Florida State's 61-56 home loss to Mercer. Trailing since the 5:32 mark of the second half, the Seminoles (4-3) had a chance to tie the game at 57 apiece with 33 seconds left but Terrance Shannon made just one of two attempts and the Bears (4-4) answered by hitting all four of their freebies in the final 23 seconds to pull off the upset. For the 'Noles, the setback marked the second consecutive loss at home and the third overall on the season. It also marked Florida State's first loss to Mercer since 1954. Recap.